Novel magnetic molecularly imprinted polymer nanoparticles (MMIPs) were synthesized by surface imprinting technology with a sol–gel process, using di(2-ethylhexyl)phthalate (DEHP) as the template. The MMIPs were characterized using Fourier transform–infrared spectroscopy (FT–IR), transmission electron microscopy (TEM), and vibrating sample magnetometry (VSM). The MMIPs displayed good adsorption selectivity for DEHP, with selectivity coefficients of 5.2 and 4.8 with respect to di-n-octyl phthalate and dibutyl phthalate, respectively. The reusability of MMIPs was demonstrated for at least eight repeated cycles without significant loss in adsorption capacity. 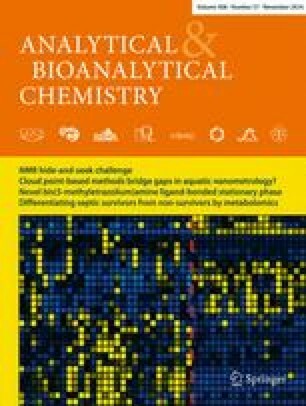 A novel method for selective preconcentration and determination of trace DEHP in aqueous solutions was developed by using the magnetic DEHP-imprinted nanoparticles as adsorbent for solid-phase extraction (SPE) coupled with gas chromatography–mass spectrometry (GC–MS). The optimum SPE conditions were as follows: adsorbent amount, 50 mg; sample volume, 100 mL; adsorption time, 20 min; eluent, chloroform; and desorption time, 5 min. Results showed that the limit of detection (LOD) and limit of quantification (LOQ) for DEHP were 0.02 and 0.075 μg L−1, respectively. The proposed method was applied to the determination of DEHP in different real water samples, with spiked recovery of 93.3–103.2 % and RSD of 1.2–3.2 %. Therefore, the developed analytical method is rapid, sensitive, and accurate, which provides a new option for the detection of trace DEHP in aqueous samples. The authors gratefully acknowledge the financial support from the National Natural Science Foundation of China (No. 41272262), Science and Technology Planning Project of Guangdong Province, China (No. 2016A040403112), and Major projects (natural science) of Education Department of Guangdong Province, China (261555101).